Things to consider: You need to have good reference material. The more information you provide will result in a easier and quicker finished service from me. Can design and compose then send you various proposals via email. 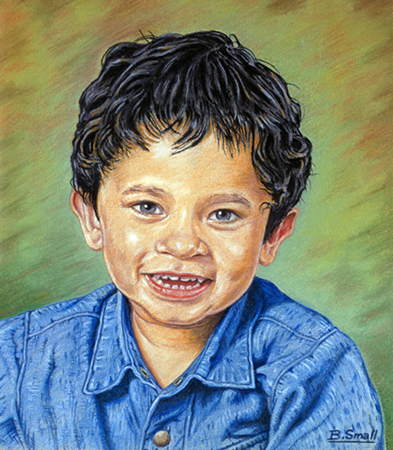 The medium is usually watercolour or pitt pastel pencil, the latter is favoured as it has a painterly effect, the portrait you see here is in this medium. Will ideally provide you with a final product which includes specialist framing, a window mount and title block. When using the pitt pastel pencil it will be necessary to include a window mount as I do not fix the pastel as this dulls down the colour. Production time is comfortably within a two week period and only effected by a demanding workload. My framer usually likes a month flexibility, but he will reduce for urgent requests. If you are at a distance then I can send the finished artwork by special delivery, this excludes the pitt pastel pencil commissions as they are not fixed. Details concerning price up front, reference materials and pre-visual sketches I can discuss with you before commencing. Each commission is unique so would prefer to reserve specifics until I have as much detail as possible. Just email or ring me. In the links section I also have a small selection of prints for sale obtainable on the Artists & Illustrators site. In fact, any images on this site you are on now are available as good quality prints for sale.